Since a few months I have my own blog, freubelheukske.blogspot.com, but in Dutch, and I noticed that there are a lot of people visiting my website, who don't speak Dutch, so I decided to make a new blog, in English. First of all, excuse my bad English.. I know how to knit (and quite good), but wasn't in the least interested in knitting anything, so I started to google in how to crochet. After a few nice youtube-movies, I decided to start with a closed granny square blanket (yes, I know now, that could take a while). 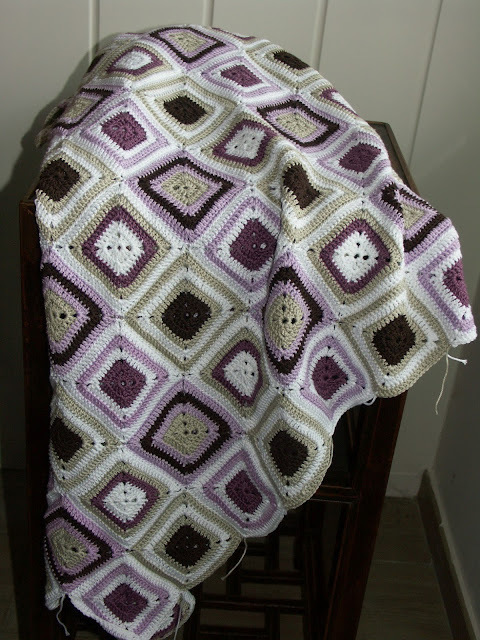 These are my favourite colours, and it is easy to crochet, but it takes a while... especially for a beginner.. I started with the pink one, then the purple, and at last the green one. And the best part is: this is not the last of it! In my next blog I show you my other creations!